The liberal media constantly harps about global warming, and for the life of me, I can’t figure out what they’re so worried about. From what I’ve seen, global warming is awesome. Thanks to the warmer temps, the public swimming pool near my house opened a full week early. That meant high school girls in bikinis were walking past my window a full week earlier, and I think we can all agree that’s pedo-riffic. The last winter in Virginia was also one of the warmest on record, and my heating bill was half of what it is normally. That means less fossil fuels were burned, and you hippies are supposed to like that, right? And forgive me if I don’t really care if some animal I’ve never seen outside of a zoo is suffering from habitat loss. Just look at those monsters in the picture. For every one of them that dies, a hundred seals live. 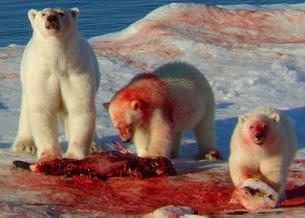 You pretend-environmentalists need to get over the mistaken belief that polar bears are the cute, cuddly bears from the Coke commercials. They’re relentless murder machines that like nothing better than wading in oceans of blood. And since they’re all white, you also have to assume they’re racists. Global warming has been the victim of a vicious left-wing smear campaign, but let’s look at the facts. Growing seasons will be longer, formerly frozen land will be opened to cultivation, and if it gets hot enough, maybe our country will finally adopt the Porky Pig dress code of an open jacket, bow tie and no pants. That’s a win-win for everyone –especially my neighbors.